2013 Tenimenti d’Alessandro, Syrah “Il Bosco” Cortona DOC, Tuscany Italy. This Italian Syrah is unmistakably Italian in it’s soul, but in many ways it reminds me of Penfolds Grange with it’s opulence that is matched by intensity and structure with ripe layers of fruit, spice and wood tones, it’s without question of sublime quality and shows this warm vintage and terroir to near perfection. 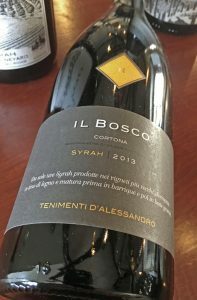 Massimo d’Alessandro’s Il Bosco Syrah from Cortona, in Tuscany, is one of the most exciting versions in Italy and is a world class wine and this 2013 does not disappoint expressing it’s warm vintage with class and ripe density, it’s a truly unique and impressive wine. Syrah first came to this old ex Etruscan enclave in Val di Chiana back in 1988 when Milan professor Attillio Scienza planted an experimental 10 acre plot using selected Rhone clones, and within 11 years the area was given DOC status for the Syrah, a truly remarkable accomplishment with Tenimenti d’Alessandro being one of the regions biggest successes. The Il Bosco is produced from 100% Syrah grapes selected from the three oldest hillside vineyards, with the Il Bosco (the forest in Italian) plots were planted between 1988 and 1995 and the wine is aged 24 months in oak, mostly French, 30% new and raised in a combination of barriques and bigger wooden casks, plus it gets an extra 12 months of bottle aging before release, similar to what you see in Brunello and Barolo, highlighting the serious nature of this wine. The Palate feels dense and chewy, but refined as well, showing copious amounts of cassis, plum and blackberry along with melted black licorice, a hint of menthol, mocha and lovely mix of dried herb, spice and floral elements with touches of lavender, lilacs and vanillin. There is a Guigal level of regal decadence here and this vintage is exceptional for d’Alessandro, making for an impressive performance, a potential 20 year wine in the offing.